Hattie Mae (McFiles) Jackson Was born on March 26, 1946, in Birmingham Alabama to Samuel McFiles and Annette Morton. She accepted Christ at an early age and attended Metropolitan AME Church while in Alabama. She graduated from Western Olin High School in Birmingham, Alabama. She met and married Edward Jackson in 1967 and moved to Cleveland, Ohio to this union three children were born Venetta, Elijah Sr., and Annette. Hattie joined Salvation Baptist church and remained a faithful member until her health began to fail. 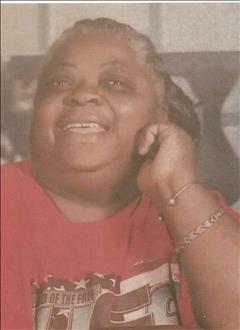 Hattie was affectionately known as Momma Hattie. She was very compassionate, outgoing and outspoken. She opened her doors and made her home a safe haven for the neighborhood children. She was a Foster mother for 15 years. She was employed by a Cuyahoga Metropolitan Housing Authority. Outhwaite Homes Resident Council President for over 10 years. She organized the Thanksgiving senior citizen dinner as well as "Blue Night." Hattie was also an Eastern Star International Mason and Order of Eastern Star Queen Dorothy #127. A member for 26 yrs., Cleveland Ohio Sister Paulette Dorsey Worthy Matron and Sister Tamara Chatmon Secretary. Hattie was preceded in death by her parents, brother, Cleveland Morton; sisters, Margarett Robinson, Mildred Moore, Gwendolyn High, Julia Williams, and Alice Yancy. Hattie Earned her wings and made her grand entrance to glory on January 14, 2019, at Metro Health Hospital. Her memory will be cherished by her children the Vanetta Ford (Larry), Elijah E. Jackson Sr. and Annette Jackson; brothers, Joseph Morton (Ann), Melvin Morton (Rose); sisters, Joan C. Black and Angelee Williams (Lester) all of Birmingham, Alabama; grandchildren, Elijah J. Jackson Sr., Derek Townsend, Angelee Jackson, LaToya Jackson and Elijah E. Jackson Jr.; fourteen great-grandchildren; and a host of nieces, nephews and cousins.